For other uses, see Grain (disambiguation). A grain is a small, hard, dry seed, with or without an attached hull or fruit layer, harvested for human or animal consumption. A grain crop is a grain-producing plant. 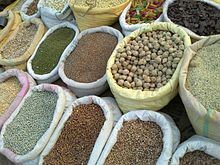 The two main types of commercial grain crops are cereals and legumes. After being harvested, dry grains are more durable than other staple foods, such as starchy fruits (plantains, breadfruit, etc.) and tubers (sweet potatoes, cassava, and more). This durability has made grains well suited to industrial agriculture, since they can be mechanically harvested, transported by rail or ship, stored for long periods in silos, and milled for flour or pressed for oil. Thus, major global commodity markets exist for maize, rice, soybeans, wheat and other grains but not for tubers, vegetables, or other crops. Grains and cereal are synonymous with caryopses, the fruits of the grass family. In agronomy and commerce, seeds or fruits from other plant families are called grains if they resemble caryopses. For example, amaranth is sold as "grain amaranth", and amaranth products may be described as "whole grains". The pre-Hispanic civilizations of the Andes had grain-based food systems but, at the higher elevations, none of the grains was a cereal. All three grains native to the Andes (kaniwa, kiwicha, and quinoa) are broad-leafed plants rather than grasses such as corn, rice, and wheat. All cereal crops are members of the grass family (Poaceae). Cereal grains contain a substantial amount of starch, a carbohydrate that provides dietary energy. Oilseed grains are grown primarily for the extraction of their edible oil. Vegetable oils provide dietary energy and some essential fatty acids. They are also used as fuel and lubricants. Because grains are small, hard and dry, they can be stored, measured, and transported more readily than can other kinds of food crops such as fresh fruits, roots and tubers. The development of grain agriculture allowed excess food to be produced and stored easily which could have led to the creation of the first permanent settlements and the division of society into classes. Those who handle grain at grain facilities may encounter numerous occupational hazards and exposures. Risks include grain entrapment, where workers are submerged in the grain and unable to remove themselves; explosions caused by fine particles of grain dust, and falls. 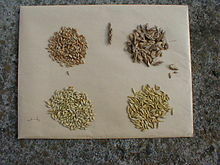 Wikimedia Commons has media related to Grain. Look up grain in Wiktionary, the free dictionary. ^ Babcock, P. G., ed. 1976. Webster's Third New International Dictionary. Springfield, Massachusetts: G. & C. Merriam Co.
^ "Lost Crops of the Incas: Little-Known Plants of the Andes with Promise for Worldwide Cultivation". Office of International Affairs, National Academies of the. Washington D.C.: National Academy Press. 1989. p. 24. ^ Vaughan, J. G., C. Geissler, B. Nicholson, E. Dowle, and E. Rice. 1997. The New Oxford Book of Food Plants. Oxford University Press. ^ Serna-Saldivar, S.O. (2012). Cereal Grains: Laboratory Reference and Procedures Manual. Food Preservation Technology. Taylor & Francis. p. 58. ISBN 978-1-4398-5565-2. ^ Lean, M.E.J. (2006). Fox and Cameron's Food Science, Nutrition & Health, 7th Edition. CRC Press. p. 49. ISBN 978-1-4441-1337-2. ^ Salunkhe, D. K. (1992-02-29). World Oilseeds. Springer Science & Business Media. ISBN 9780442001124. ^ "Frequently Asked Questions About Flowing Grain Entrapment, Grain Rescue and Strategies, and Grain Entrapment Prevention Measures" (PDF). Agricultural Safety and Health Program, Purdue University. April 2011. p. 1. Retrieved November 4, 2012. ^ Occupational Safety and Health Administration. "Combustible Dust in Industry: Preventing and Mitigating the Effects of Fire and Explosions". Safety and Health Information Bulletin. United States Department of Labor. Retrieved 29 October 2013.